I am begginer and I have few questions. 1. Can I able to place basket order during market hours and how to place basket order via kite. 2. Can I able to place multiple stock bracket order. Via basket 3. Is it possible to cancel all pending order with one step. Is it possible to cancel all pending order with one step. This is possible, go to order book, select all and cancel all pending orders at once. There is no option to place basket orders via kite for now. Actually I was personally Facing problems with Pi. It hangs on eventually. Then I tried with PIB account. it went smoothly there. 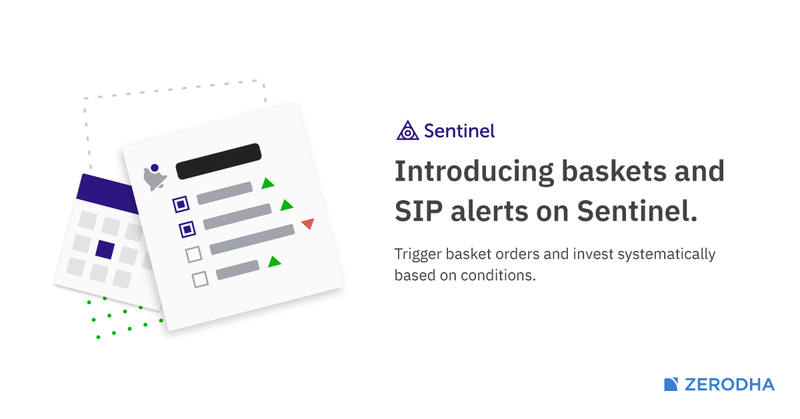 With Sentinel, you can now create and trigger basket orders based on conditions. You can also invest systematically (SIP) in stocks, ETFs with SIP alerts. But Can we place bo, co orders in those basket orders? If we can select all orders and cancel in one go then why can’t we have options to select all cancelled orders and repeat order in one go? can we? But why do you want that? Can understand reason for cancelling but why again placing them all again? P.S. - I know zerodha trader has this feature of basket orders but it is very complex and cumbersome to use. You mean, third party services offer this to basket orders get placed on kite? @siva Siva, Since all pending limit orders get cancelled at the end of the session, if someone wants to repeat those orders for next day as AMO it becomes very useful. Let’s say for all these 5 stocks prices were above the entry price all day so none of these orders get executed. So after 4.15pm all these orders get cancelled automatically and can be seen as cancelled orders. Now if my buy trade for these is still valid I will have to go to each individual cancelled order to repeat them for tomorrow as AMO orders. Thus, if such a feature existed which allowed to check the orders and repeat them in one go as AMO orders, would’nt it be great! I agree but may not be possible for now, also as markets are closed may be one can place manually, also when adding as bulk repeat, it may not be possible to change them to AMO. Ok! So doing it manually is the only way… no other workaround?